The Human Machine Interface (HMI) includes the electronics required to signal and control the state of industrial automation equipment. These interface products can range from a basic LED status indicator to a panel with touchscreen interface. 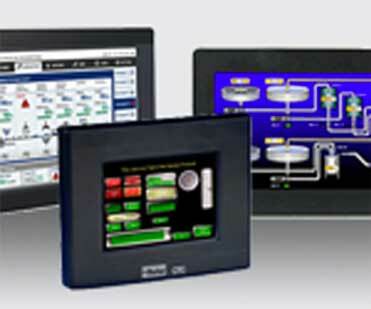 HMIs are used primarily on Windows-based machines, communicating with programmable logic controllers (PLC) and other industrial controllers. HMIs translate large amounts of complex data into more accessible information. They connect people, applications and machines for greater collaboration and efficiency. HMIs should also simplify the operators’ job and provide them with all the necessary tools to control the production process and easily identify and correct abnormal conditions. HMI applications require mechanical robustness and resistance to water, dust, moisture, a wide range of temperatures, and, in some environments, secure communication. Our HMI products are manufactured by some of the best in the business.